Set of 6 small sachets filled with all-natural dried French lavender buds. 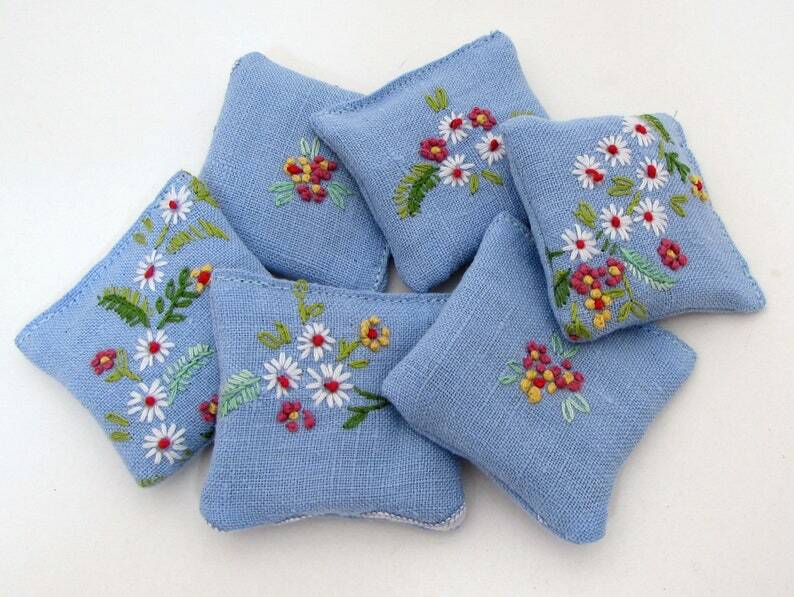 Each sachet features vintage floral embroidery on blue fabric. Sachets measure 2 1/4" square. These are great for keeping your dresser drawers smelling lovely. You can also throw these in your dryer to freshen your laundry. You will receive 6 sachets very much like the ones pictured here, made from the same vintage linens. These are individually packaged in cello bags, perfect for gift-giving, party favors, or stocking stuffers! Please contact me if you would like more than 6 -- there will be a discount! Have a specific fabric or colors in mind? Need a bunch for an event? Contact me for a custom listing! Wrapped in vintage sewing pattern paper and tied with a cotton bow, the perfect complement to your vintage-inspired gift. Beautiful! Very sweet sachet items! The lavender pillows were adorable! Are a wonderful compliment to gifts. Thank you so much! I accept credit cards and gift cards through Etsy.com, or payment through PayPal. If you have a coupon code, please enter it in the appropriate box when checking out, and your discount will be applied automatically. If you are in any way dissatisfied with your purchase, please contact me right away. I will work with you on a case by case basis to resolve any issues. If you want to return an item, you must contact me within 14 days of receiving your item, and you will need to pay for return shipping. Customized items are not eligible for return. Orders are shipped each weekday. If you would like an item shipped directly to another person as a gift, please mark it is a gift to avoid confusion. In most cases, your items will arrive in lovingly and proudly recycled packaging. I cannot guarantee delivery by a certain date, but I can give you an estimate based on USPS average delivery times. Please feel free to contact me with consignment, wholesale, or custom order inquiries.